Itemis-glen-3367 - "I want the tooth fairy." Itemis-glen-3368 - "We have the Pierre model, the ever popular Lalonde model . . . and the MacEachen which sold very well this past year." Item is-glen-3364 - "Answer; One alderman to hold the bulb and the others to turn him." 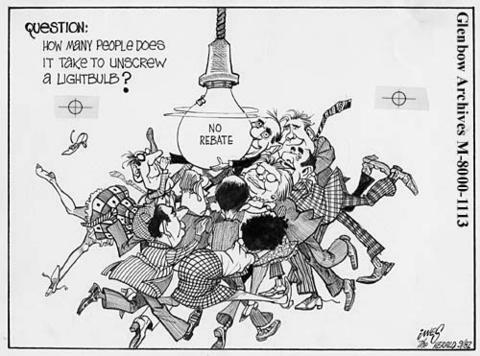 "Answer; One alderman to hold the bulb and the others to turn him."